Latex Gloves Sold Wholesale by the Case: High Quality Certified FDA/ADA/NFPA Approved. Used In Medical, Dental, Health Care and Food Prep. Industrial and Exam Grade available. Nitrile Gloves: Safe substitute for latex made from synthetic allergy free compounds. Size Small thru Extra-Large of FDA, ADA and OSHA approved gloves. Sold Wholesale by the Case & Pallet. Vinyl Gloves: Synthetic alternative to latex gloves. Our Vinyl Gloves are powder free ADA, FDA and OSHA approved. Select glove sizes Small thru Extra-Large. Sold Wholesale by the Case. Food Handling Gloves used for food preparation. We carry plastic gloves and Clean Ones food service gloves including latex, nitrile and vinyl food prep gloves accepted by the FDA and OSHA. 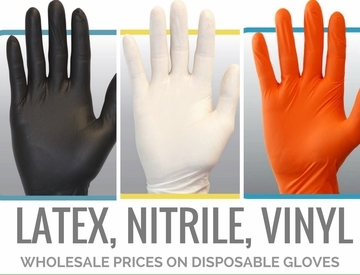 As the premiere online wholesale distributor of Latex, Nitrile and Vinyl Gloves our vision is to create enduring customer relationships by offering small business and medical professionals the best value, comfort and protection they require from their disposable gloves. Our latex, nitrile and vinyl gloves are typically sold by the case and amounts vary from 500 to 1,000 per case. Select sizes Small thru Ex-Large and see the difference in our service, product and price. Selecting the right glove is not an easy task given challenges faced by healthcare workers or professionals in the Medical, Dental, Food and Auto Industries. There are a number of factors and issues to consider when purchasing protective gloves. Rest assured you can count on our glove professionals to help you make the right choice today.